Are you aware that we narrowly missed a colossal natural disaster two weeks ago? 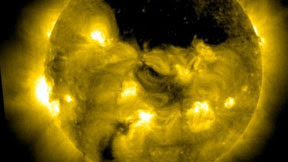 Apparently one of NASA's space telescopes that is aimed directly at the sun, discovered a massive "dark spot", which turned out to be a coronal hole that covers nearly one-quarter of the sun's surface. But here's the deal: that hole is far from harmless; it is spewing solar material and gas into space. Known as a "coronal mass ejection", this massive solar discharge could have caused serious harm; knocking out power, cars and iPhones throughout the United States. And this kind of occurrence is not unknown. In 1859, a similar Electromagnetic Pulse (EMP), named after astronomer Richard Carrington, actually melted telegraph lines in Europe and North America. One also occurred in Canada in 1989, knocking out Quebec's electric transmission system. And this is the exact EMP event that everyone from "preppers" to professional experts have warned us about. And when you hear their comments, it is evident that this latest event has only amped up the warnings. The Washington Examiner reported what a trio of authorities had to say. "The world escaped an EMP catastrophe," said Henry Cooper, who led strategic arms negotiations with the Soviet Union under President Reagan. "There was a near miss about two weeks ago; a Carrington-class coronal mass ejection crossed the orbit of the Earth and basically just missed us," said Peter Vincent Pry, who served on the Congressional EMP Threat Commission from 2001-2008. And then there is former CIA Director James Woolsey who has been recently demanding that Washington prepare the nation's electric grid for an EMP, either from the Sun or an enemy's nuclear bomb. All three experts want the 2,000-3,000 transformers in the grid protected with a high-tech metal box and spares ready to rebuild the system. Woolsey said knocking out just 20 would shut down electricity to parts of the nation "for a long time." It doesn't take much imagination to see the damage that a grid-down scenario would do to our nation's stability. No electricity means more than just no phone service --- it means no water, no air conditioning, no medical devices, no transportation, no light after darkness falls, no refrigeration, no gasoline --- it will result in inconvenience at the least, and death in the long run. And with rumors that North Korea is reportedly testing a device to attack the U.S. with an EMP, we have no time to lose. At a conference in Washington D.C. last week, Cooper suggested that North Korea might already have the capability to launch an EMP against the United States. He said in December, North Korea tested its so-called Space Launch Vehicle which could deliver a stealthy nuclear attack on the United States by orbiting a nuclear weapon over the South Pole where the U.S. has no radar or missile interceptors facing south. North Korea, he said, apparently orbited a satellite over the south polar region on a trajectory and altitude consistent with making a surprise nuclear EMP attack against the United States. But now, it is not only our enemies we have to worry about, but the very Sun that supports life on this Earth. It is quite apparent that the Big Ball of Fire in the Sky is now launching space debris that threatens to collide with us as we orbit around it! I don't really understand all the intricacies of our galaxy and the planets, but I know Someone who does. If I wasn't a Believer, I can only imagine how terrifying this possibility would be. And don't get me wrong; I'm not exactly looking to test my survivalist skills. But I have to rely on my faith that the One who created the Sun has control over it. Nothing happens that He does not allow. So if it is His plan that we suffer such an event, whether naturally or by human hands, then I know that He will see us through it. But it still might be a good idea to plan for the worst. We might just have received a warning. Genesis 1:1-4 "In the beginning, God created the heavens and the earth .... And God said, “Let there be light,” and there was light. And God saw that the light was good."